The last Thursday of January is perhaps the most nerve-racking day of the regular season for many NBA standouts as they await their All-Star fate. NBA All-Star starters — including two guards and three frontcourt players from each conference — were revealed a week ago. That left reserve spots for just seven more players on each of the Eastern Conference and Western Conference All-Star squads, who are voted in by the conference’s coaches. And unless NBA All-Star candidates can get a scoop beforehand, they must wait until Thursday evening to learn from the league if they punched a ticket to New Orleans. 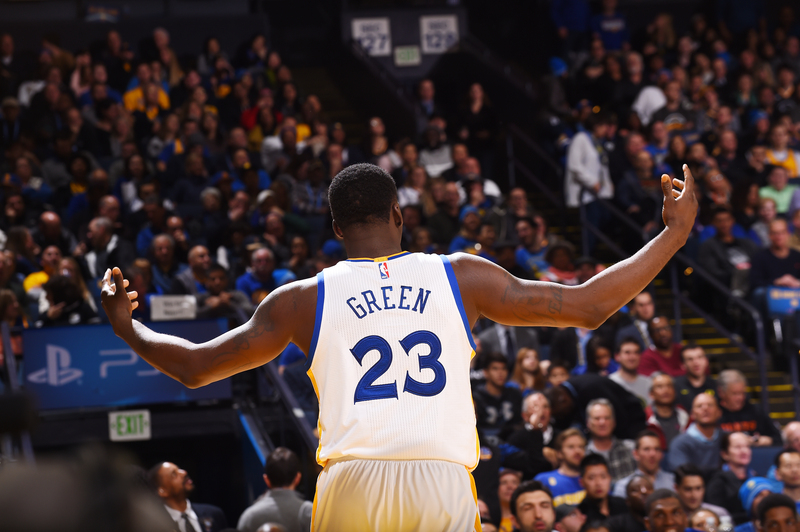 “It was tough last year because there was a chance I would start, so anticipating that first Thursday and it not happening made waiting until the following Thursday when they named the reserves seem like forever,” Golden State Warriors forward Draymond Green, a 2016 NBA All-Star, told The Undefeated. Draymond Green (No. 23) of the Golden State Warriors reacts to a play during the game against the Portland Trail Blazers on Jan. 4 at Oracle Arena in Oakland, California. Under a new voting format, a combination of media, player and fan votes determined the East and West All-Star starters this year. Cleveland Cavaliers forward LeBron James and guard Kyrie Irving, Chicago Bulls forward Jimmy Butler, Toronto Raptors guard DeMar DeRozan and Milwaukee Bucks forward Giannis Antetokounmpo, a first-time selection, were voted in as East starters. San Antonio Spurs forward Kawhi Leonard, Golden State Warriors forward Kevin Durant and guard Stephen Curry, New Orleans Pelicans forward-center Anthony Davis and Houston Rockets guard James Harden were named as West starters. Voting by coaches in their respective conferences for All-Star reserve selections was completed Tuesday. The biggest snub from the All-Star starters selections was Oklahoma City Thunder guard Russell Westbrook, who just earned the 60th triple-double of his career during Oklahoma City’s 114-104 victory over New Orleans on Wednesday. It’s very likely that West coaches will vote Westbrook in for one of the team’s remaining seven spots. That appointment would also make him teammates again with Durant, who left the Thunder for the rival Warriors last offseason. Russell Westbrook (No. 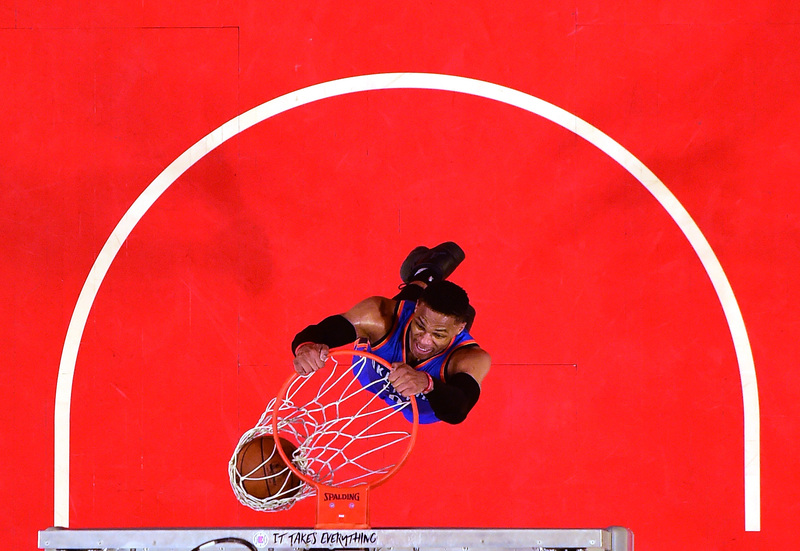 0) of the Oklahoma City Thunder dunks after a steal against the Los Angeles Clippers at Staples Center on Jan. 16 in Los Angeles. Other West All-Star reserve candidates include Green, Golden State guard Klay Thompson, Memphis Grizzlies guard Mike Conley and center Marc Gasol, Sacramento Kings center DeMarcus Cousins, Utah Jazz center Rudy Gobert and Gordon Hayward, Minnesota Timberwolves forward-center Karl-Anthony Towns and Portland Trail Blazers guards Damian Lillard and C.J. McCollum. East All-Star reserve candidates include Boston Celtics guard Isaiah Thomas, Toronto guard Kyle Lowry, Cleveland forward Kevin Love, Indiana Pacers forward Paul George, Philadelphia 76ers rookie center Joel Embiid, Washington Wizards guards John Wall and Bradley Beal, Charlotte Hornets guard Kemba Walker, Atlanta Hawks forward Paul Millsap and center Dwight Howard, Miami Heat center Hassan Whiteside and New York Knicks forwards Carmelo Anthony and Kristaps Porzingis. Conley is nervously hoping to land his first NBA All-Star nod in his 10th season. The 6-foot-1, 175-pound guard was averaging 18.9 points and 6.2 assists entering Wednesday’s game against Toronto. Mike Conley (No. 11) of the Memphis Grizzlies stands for the national anthem before the game against the Toronto Raptors on Jan. 25 at FedExForum in Memphis, Tennessee. 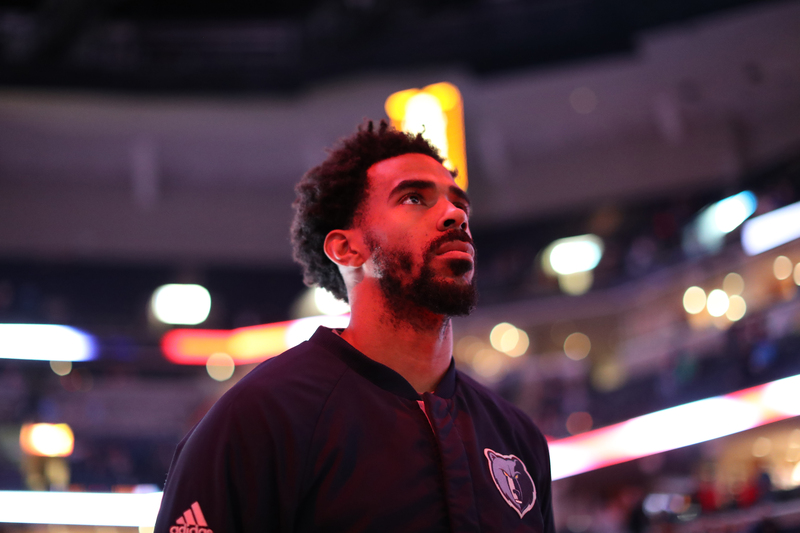 “I’m sure I will be anxious and excited knowing that by the end of the day one of my dreams can possibly come true,” Conley told The Undefeated. While Green could have the lowest scoring average in the All-Star Game as he averaged 10.6 points entering Wednesday’s game against Charlotte, he also averaged 8.4 rebounds and 1.6 blocks and appears to be the early front-runner for the NBA’s Defensive Player of the Year award. Green is hopeful that the coaches believe he is worthy of being an All-Star this time around, too. Cousins is a projected shoo-in as a West All-Star reserve as he is averaging 28.3 points and 10.3 rebounds. While there may be a lot of nervous All-Star candidates Thursday, the 2016 NBA All-Star has a bigger worry. “I was nervous last year, because you never know when the politics can work against you. I’m not really concerned. I got one thing on my mind: the playoffs,” Cousins said.